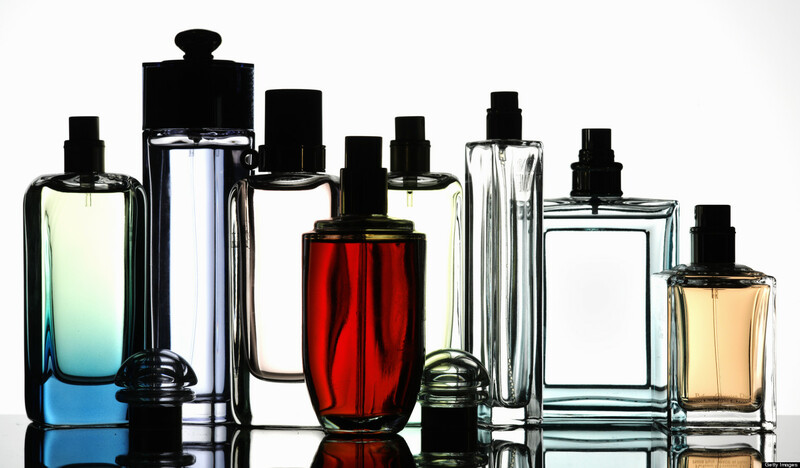 From Venice to Florence to Grasse to Versailles, perfume has always been a tool to ensure one never has to bathe. By drenching their clothes in scent, the aristocracy of the sixteenth and seventeenth centuries chose to smell of as many odors as possible, including their own. Perfume became an expensive commodity displaying wealth and status even for the upper middle classes. Would you perfume your mule? What scents do you think they combined? Did scents have a language the way that flowers do? Comment below. Princes and noblemen from surrounding city-states took to wearing Venetian scents. Florence, its influence bergeoning as the banks of the Medici and other local families flourished, soon established its own perfumeries. The most famous of these was that associated with the church of Santa Maria Novella. It was established in 1508 by Dominican monks—whose monasteries supplied the botanical ingredients. Among the patrons where Medici family members and popes (who were often one and the same). It was a Florentine, Renato Bianco, who introduced perfume-making to Paris. René, as he was known, was the personal perfumer of the fourteen-year-old Catherine de’ Medici, niece of the pope and an avid fragrance user throughout her life. When she became the bride of Henri II of France in 1533, Catherine arranged for René to open trading premises in Paris, where he would be lionized. Parisians quickly developed a passion for perfume-wearing and soon for perfume-making, so much so that the sixteenth century has been called by one French expert as le siècle du parfum. In that century, the capital of European perfumery shifted again. The new center became the French town of Grasse, found not far inland from Nice and Cannes. Grasse had originally risen to fame in the thirteenth century as a leather processing center, producing gloves that would be worn by European royalty. To reduce the objectionable odor of the tanning process (which involved the use of urine), the gloves of Grasse were scented—which in turn created a craze in fashion circles across the continent. Glovemaker-perfumers, the name these artisans gave themselves (in fact, the French Glovers’ and Perfumers’ guilds were linked by law from 1190-1798) were exalted among craftsmen. They superseded tanners, who were forced out of business by high taxes. After the tanning trade decamped to more favorable quarters, Grasse concentrated on the creation of perfumes, its rise as a perfume mecca abetted by its superb location, climate, chalky soil, and mountains to the north, which hold this city in its sunny embrace. The soil allowed for the creation of underground drains, which guaranteed a constant supply of water. In time, Grasse perfumeries were turning out massive quantities of tuberose, jasmine, myrtle, lavender, and orange flower perfumes, avidly sought after by the nobility. The monarchy throughout most of Europe assumed enormous power during the sixteenth century—nowhere more obviously or ostentatiously than in France. The second half of that century was dominated by Louis XIV in Versailles, dubbed “the sweetest smelling monarch that has yet been seen.” The royal perfumer M. Martial was said to compose a perfume for each day of the week. The Sun King left a legacy of elegance and worldly pleasures by establishing the highest-known production standards for his industries du luxe. Rules of personal adornment were followed to the last frill. Elaborate hairdos and clothing assumed life-or-death significance. Along with washbasins, bathtubs, and soap, light fragrances became vital munitions in the growing arsenal of grooming aids. The quest for such perfumes was helped along by an unlikely set of factors. Before the French Revolution, Marie Antoinette, dressing shepherdess-style and affecting a life of bucolic simplicity, turned to lavender and other delicate scents—an aromatic premonition of things to come. 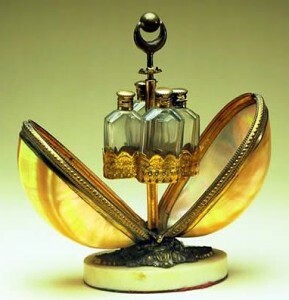 After the Revolution, perfumes were banned in condemnation of aristocratic excess. And although fragrances returned to favor during Napoleon’s reign and the Bourbon Restoration, they were decidedly lighter than the former status quo, and reflected society’s yearning for simplicity. This desire has continued onto today’s atomized perfume sprays. Adapted from Green, Annette, and Linda Dyett. 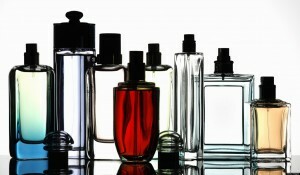 “The Smelling Box, the Vinaigrette, the Pendant Flacon, and the Chatlaine.” Secrets of Aromatic Jewelry. Paris: Flammarion, 1998. 61-67. Print.